Thoroughbreds are well known for their less-than-stellar hooves, and a great solution for endurance riding has been outfitting my two Off-the-Track Thoroughbreds with EasyShoes, including a 22-year-old mare that still loves to do limited distance rides. I’m a rider that’s just out to have fun at endurance rides. I’ve come in first, last, and everything in between at endurance rides, and my goal is always to complete a ride with a happy, healthy horse. I live and train in an area about 200 miles south of where most Florida endurance rides are held, and my local terrain is clay and sand, with very few rocks, so my horses can train barefoot. 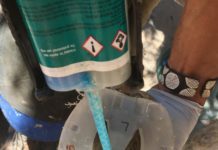 After one of my mares sustained a painful stone bruise several years ago at a ride that had significant areas of rocks, I vowed to provide protection for my horses’ feet. As I searched for the right solution, a key criteria was no metal, i.e., no nails and no steel/aluminum. After watching numerous videos about Glue-Ons, I tried them. At first, there were some failures, largely because I didn’t follow the directions. 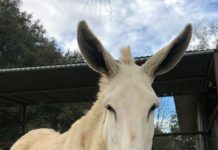 Initially, I didn’t understand the importance of thoroughly drying the hooves, especially in a humid climate, and avoiding all sources of oils (yes, that includes fly spray). But, I learned from my mistakes and made positive strides. For me, Glue-Ons were good but not the best solution. 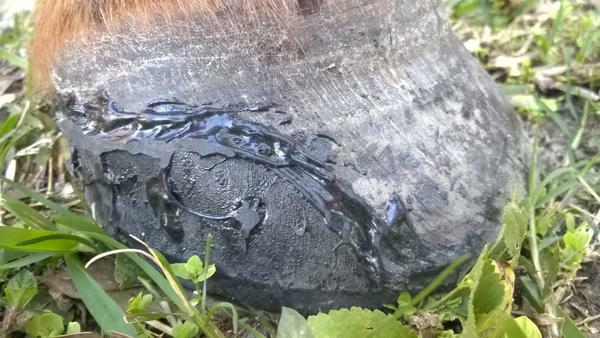 I struggled with getting some glue under the hoof, the moisture that built up in the hoof after a few days due to the humid climate, and then getting them off. …And then I loved EasyShoes. With the exception of one experiment wherein I didn’t put the toe bead of Adhere, I haven’t lost an EasyShoe at a ride (moral of the story: always, always do the toe bead!). My EasyShoes may not look pretty, but they are functional. I put on my EasyShoes a bit different than the videos show. Rather than use the 180cc tube of Adhere and glue gun, I use one 50cc tube and the small glue gun from Vettec. It fits in my hand much better, requires much less hand effort, and is more precise. Plastic knives are for more than just camping! 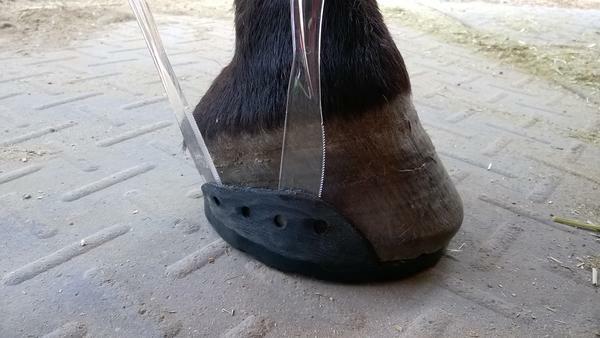 In addition, I fit the EasyShoe on the hoof with popsicle sticks or plastic knives and then glue them in place. I pull out the lip of the EasyShoe just a little and insert the Adhere tip and squeeze. It drips down plenty and never goes under the sole. No hoof to hold up, no twisting. My horses seem to love getting their EasyShoes glued on because they stand perfectly still. I’m by no means a pro, but I can glue on a front set of EasyShoes in about 30 minutes total. One of my horses is a high/low, and sometimes I feel it best to insert a very short wedge in her left EasyShoe to keep her balanced. No problem! 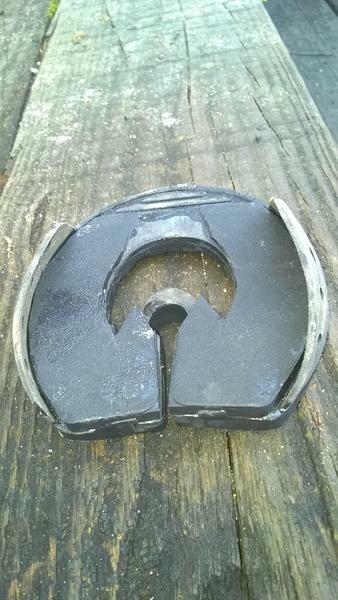 A Castle wedge cut to shape the EasyShoe, a little SuperGlue, and the same gluing process works perfectly. A wedge in an EasyShoe? Yes! I have been trimming my own horses’ hooves for about six years now, and my horses go no more than three to four weeks between trims. Trimming with the Electric Hoof Knife makes the trim much easier, as well as scuffing up the hoof wall in preparation for the glue. It also makes it easy to pretty up your glue job as much or little as desired. 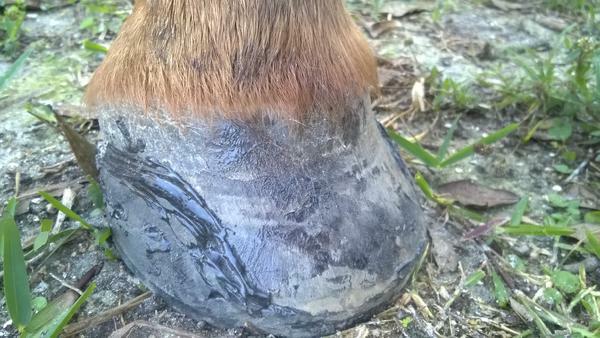 I’m not in a hurry to take off EasyShoes after the ride because the hoof has plenty of exposure and stays healthy. When I am ready to take them off, that’s much easier too. I purchased a Tekton upholstery tack lifter, and removal takes all of five minutes with a rubber mallet. Easily removing EasyShoes with an upholstery tack lifter. My horses are in much better shape after completing a ride with EasyShoes. No more stone bruises, and more confident trot outs at rides. Because EasyShoes are so easy to put on and take off, my back feels great when starting a ride, so I am able to ride looser and my horse subsequently feels better. 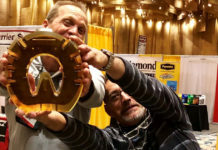 Win/win for all!